When it comes to energy use, buildings are living, breathing things. From lighting to HVAC to backup generators, buildings consume 40 percent of U.S. energy and produce 30 percent of U.S. carbon emissions. Generally, some buildings have lower energy consumption during certain times of the day or year, when lights are out at night, for example, or when an office building is closed for vacation. Hospitals, on the other hand, are always standing watch. Operating 24 hours a day, 7 days a week, 365 days a year, hospital facilities are particularly energy intensive. In fact, according to the U.S. Energy Information Administration’s Commercial Building Energy Consumption Survey, the energy use intensity of hospitals is nearly three times that of a typical office building. This costs an average hospital nearly ten times the amount other commercial buildings spend on energy. And that’s a problem that needs to change. When looking at energy consumption, there are also reputation and market factors to consider. For instance, a company’s sustainability efforts, such as environmental, social and governance (ESG) programs, can affect a company’s performance and market value. To cut both costs and carbon dioxide emissions, many commercial buildings, including hospital facilities, are starting to rethink their energy use. Hospitals are in a particularly unique position because they typically operate older facilities, having tight operating margins, and have significant deferred maintenance. Hospitals could realize significant savings from new technology and infrastructure but are under increasing pressure to cut costs in the face of increasing healthcare costs. Unfortunately, most businesses, including hospitals, don’t have the capital, data or resources to reap all the potential savings of energy efficiency technologies. The first reason hospitals struggle to get energy efficiency upgrades approved is the need for significant upfront capital. The capital budgeting process for any business can be uncertain and arduous and most hospitals have limited or no capital to fund projects. Also, there are likely other revenue-generating projects competing for limited resources. Another reason energy efficiency is a challenge is that hospitals lack detailed data about their energy use. They can’t identify areas of greatest inefficiencies (e.g. are the lights wasting more energy than the HVAC? If so, exactly how much more energy do they waste? ), don’t know which upgrades would be the most cost effective and so on. So even if they have the capital, they might not invest in upgrades that deliver the highest level of savings. The third hurdle for energy efficiency is resources on the ground to deploy projects quickly. Even if a hospital network does have the capital and knows where to deploy it most effectively, staff still needs to manage multiple vendors, procure equipment and monitor project performance. And that’s a resource most hospitals lack, leading, once again, to a standstill where energy efficiency is concerned. In the face of these challenges, a number of hospitals are turning to a new method of saving on both energy and costs. They hire outside vendors to manage the entire project: from running a diagnostic of their energy consumption, to making the necessary upgrades (including lighting, HVAC and more), to monitoring performance and reporting savings. This emerging trend, known as “Efficiency-as-a-Service” (EaaS), lets hospitals bypass the legacy procurement process and transfer the risk, capital investment and “boots on the ground” resources to manage projects across multiple sites and geographies. The EaaS providers begin by assessing energy consumption and developing a unique upgrade plan for the entire hospital network. By addressing the entire portfolio, hospitals can get out of the audit-bid-proposals-budget approval cycle, which takes months, and instead outline a number of savings and timeline criteria, and leverage volume purchasing and scale to cut costs. After pinpointing the areas that stand to benefit the most, the EaaS providers then manage every step of the audit, design, rebate administration and installation to deliver a turnkey retrofit. Many also assume project risk, such as the performance of the upgrades or any cost overruns that might occur. Some of these companies, like California-based Redaptive, for instance, use IoT-enabled measurement devices at the equipment level to verify actual savings and provide transparent billing (a pay-for-performance model ubiquitous in the electric power industry). 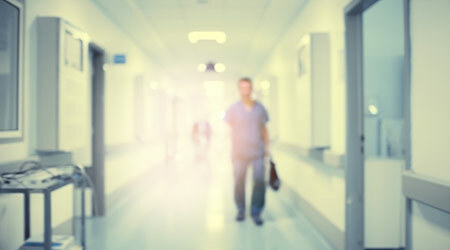 Redaptive’s EaaS solution powered by AT&T connectivity is helping deliver nearly $600,000 in energy savings from LED lighting retrofits at two hospitals in a Connecticut hospital network. However hospitals choose to upgrade their facilities, energy efficiency is a worthy investment. Healthcare facilities have an opportunity to free up capital and benefit from significant cost savings, while improving patient and employee experiences, their corporate reputation and the health of the planet. John Rhow is the Co-CEO of Redaptive, a provider of large-scale energy efficiency and IoT solutions.